Carmen LeFleur makes beautiful hand-stamped jewelry -- I was delighted that they sent me a customized piece! 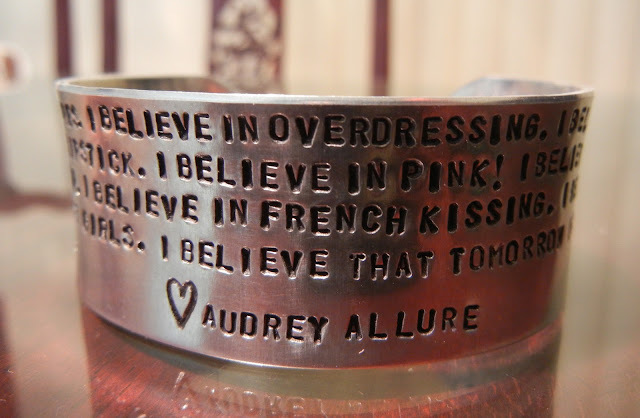 I originally asked for it to say only Audrey Allure but I was surprised when I saw a Audrey Hepburn quote on it as well -- one of my favorite style inspirations. Carmen LeFleur also offers necklaces and charm bracelets, as well as cuffs. The designer behind the brand, Terese Whitehead, named the company after her beloved grandmother, whom she shared a close bond with - which is so sweet! They're having a current promo and if you follow @tweetclf on Twitter, you can get $5 off your purchase! Ohh, Audrey Hepburn ♥ This piece of jewellery is just lovely! This is awesome. Great photo of the piece! 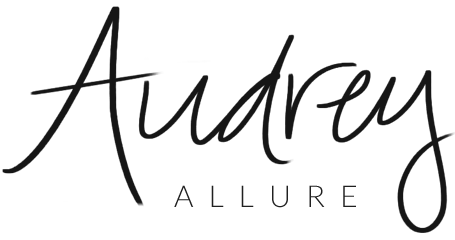 That is gorgeous Audrey! I love the quote on it! Hand stamped jewelry is definitely the thing now. Beautiful and Enjoy it! Have a great weekend doll. Lovely piece of hand crafted jewelry! & Beautiful story!! AMAZING !! I want one for myself!!!!! Not sure what I'd get stamped on it but I NEED THIS! That is seriously amazing! I love the quote and their concept. It's a great and unique piece to have. this turned out so cute!!! love it. Amazinnng piece, so original and pretty! I have an absolute love for words on jewellery! This is so pretty and unique! I adore that quote! this is sooo cute! what a pretty piece of jewelry =) hope you are having a great weekend! It's so beautiful, and meaningful. Truly lovely piece!